You'll learn two things about Sniper: Ghost Warrior 2 from this teaser trailer. The first, rather obviously, is that it includes sniping. The second is that it also has plenty of gratuitous armpit stabbings. That one's also kind of obvious, since it's now mandated by law that all gritty, "realistic" war games must include at least one instance of unnecessarily detailed knife crime. Back to the sniping. 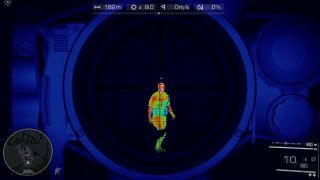 The trailer shows that the game will include a thermal imaging camera, scientifically proven to be 21% cooler than sniping in the daylight, and a return of the "hold breath to slow time" mechanic that has featured in every sniper game ever made, but is disappointingly absent from real life. There's also a follow-the-bullet kill-cam, albeit one that appears to be less gleefully horrific than Sniper Elite V2's . Sniper: Ghost Warrior 2 is due for release in January.